At the same time, since Norway’s massacre led to statements by populist leaders rejecting violence, you might also suppose that the European left could ease up on its resistance to the idea that multiculturalism has brought parallel societies, disrespect for national laws and traditions, and a threatened sense of identity to countries with hundreds of years of democratic history. Neither assumption is hopeless. But each enters the area of very wishful, perhaps naïve surmise. … Now the Dutch are dealing with the fact (and its potential political impact and manipulation) that Anders Behring Breivik, the confessed Oslo killer, spoke in his 1,518-page manifesto of his admiration for Geert Wilders. Of course, alongside his stated hatred of multiculturalism and Muslim immigrants, Mr. Breivik also said confusedly that the Europeans he most wanted to meet were Pope Benedict and Vladimir V. Putin (whose vision of “democracy” appealed to him), that he read Homer, Kafka, John Stuart Mill and Winston Churchill, and liked Lacoste shirts and Chanel Platinum Egoiste cologne. In any case, the reaction here, at its most shrill, was at screech level. Now the Dutch are dealing with the fact (and its potential political impact and manipulation) that Anders Behring Breivik, the confessed Oslo killer, spoke in his 1,518-page manifesto of his admiration for Geert Wilders. although this may have to wait until next week. During the concert at the end of the tenth anniversary commemoration of the 9-11 attacks in Trocadéro square in Paris across from the Eiffel Tower (the second largest 911 commemoration in the world next to those in Manhattan itself, according to the organizers in The French Will Never Forget association), Grace Weber and Blaine Krauss sing National Anthem under Jean-Pierre Heim's recreation of the World Trade Center's Twin Towers and under a full moon. According to Danish news reports (the secretary general of NATO, Anders Fogh Rasmussen, is Danish), including Berlingske Tidende, NATO's headquarters in Kabul are under a major attack, with the Taliban issuing a statement that suicide bombers are involved in a "mass suicide action." NATO headquarters in Kabul is under attack, and there is strong shooting at a central square in the city. "ISAF headquarters is currently under attack," says a military source. But a spokesman for ISAF would not confirm that information. The International Security Assistance Force is the NATO-led force in Afghanistan. Previously, the Afghan capital was rocked by at least six powerful explosions, and a Taliban spokesman stated that its rebels are engaged in a "massive suicide attack", which targets government offices as well as the Afghan and foreign intelligence services. An eyewitness told Reuters that the attackers have penetrated a tall building under construction and that shots are being fired against soldiers who are returning the fire. The fighting is taking place next to a barracks and the Marriott hotel. The first explosion was heard in the embassy area and the roads there were closed shortly after. Soon thereafter followed more explosions. "There are a number of fighters by Abdul Haq Square," the head of Kabul's criminal police, Mohammad Zahir, told Reuters. Several Taliban insurgents have taken up positions with rocket launchers, AK-47-rifles, and bulletproof vests near the embassy district, said a spokesman for the Islamic insurgency movement. Maybe the explosion was not that big. This could indicate that the explosion was not as great as first reported. Indeed, the Danish Refugee Council's representative in Kabul, Stefano Cordella, reported that neither felt nor heard the explosion. "Our office is located two kilometers from the embassy area, but we didn't hear the explosion. Right now we are following the developments on television." TRIBUNE - Le président des États-Unis Barack Obama a choisi Le Figaro pour commenter l'après-11 Septembre. Dix ans après les attentats suicides contre la première puissance mondiale, il renouvelle son soutien aux nations et aux peuples en quête d'un avenir de paix et de prospérité. Le Figaro takes pride in the fact that Barack Obama allegedly chose its pages to publish an op-ed. During the tenth anniversary commemoration of the 9-11 attacks in Trocadéro square in Paris across from the Eiffel Tower (the second largest 911 commemoration in the world next to those in Manhattan itself, according to the organizers in The French Will Never Forget association), Grace Weber and Blaine Krauss sing America the Beautiful under Jean-Pierre Heim's recreation of the World Trade Center's Twin Towers before doves are released into the skies. The hero of the day was Tony Benetatos, the FDNY firefighter featured in the Naudet brothers' "9/11" documentary, who was given several medals, including one by U.S. Ambassador to France Charles Rivkin. Today marks beginning of another war: the "peace movement," looking for Islamophobia wherever it could be inferred, the mothers of fallen troops, and in every other way preferred the failure of their own society, preferring it to negotiate from a position of weakness with a barbaric, illiberal violent movement seeking the violence that they craved in their "revolutions" to "make the world better." Add to that the banal, the banalization, and the misuse. Such as it is, one Euro-policy blogger is looking for other ways to "celebrate 9-11", and tries to use it to point attention to two aged and pointless press statements by Eurocrats. On September 11, 2011 — the tenth anniversary of the attacks of 911 — a commemoration was held in the Jardin du Luxembourg with grievers (in the top photo the French Heritage Society's Marie-Sol de la Tour d'Auvergne) laying wreaths at the foot of Bartholdi's model for the Statue of Liberty, including one in the form of the World Trade Center's Twin Towers. As Le Monde Commemorates 911, Plantu is back in his usual style, with a full page inside Le Monde Magazine bringing back 10 years of cartoons that belittle the human toll; or that suggest that Uncle Sam deserved whatever it had coming; or that compare the 2011 attacks of September 11, 2001, to Pinochet's coup d'état in Chile on September 11, 1973. So No Pasarán is looking back at 10 years' worth of posts (six or seven, really) as well and checking out what it has been saying on the subjects so dear to the hearts of leftists everywhere. John Rosenthal's Transatlantic Intelligencer article ought to be mandatory reading for anybody studying September 11 and anti-Americanism. In The Legend of the Squandered Sympathy, John Rosenthal notably mentions the cartoon that Plantu saw fit to reproduce on the weekend of the 10th anniversary. Such was the tenor of Le Monde’s coverage, in effect, just one week after the attacks. The monotonous drone of denunciations continued as the prospect of a military strike against Afghanistan materialized in the weeks ahead, with distraught “New York Jews,” Pashtun warlords and the estranged son of the “O’Dea,” the archetypal all-American family, all chiming in to register their protest and all sounding surprisingly like “third-worldist” Parisian intellectuals – or even indeed like the publisher of Le Monde. (Among other things, the legend of the squandered sympathy occludes the fact that even while a substantial majority of Europeans polled, including in France and Germany, showed spontaneous understanding for American military actions in Afghanistan, large swaths of Europe’s socialist and social-democratic intelligentsia opposed any American military response to the 9/11 attacks whatsoever.) The “boomerang” image went on to become the favored heuristic device of Le Monde and its affiliated publications in their treatment of 9/11. Thus the first issue of the monthly Monde Diplomatique to appear following the events bore the thematic headline “Boomerang Effect” [it also has an article by Maureen Dowd]. 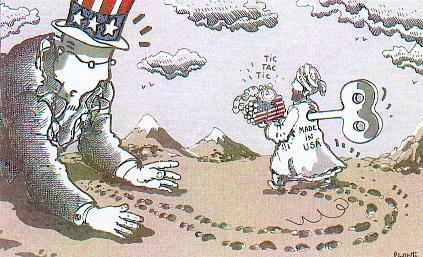 In a pictorial variation on the same theme, a special insert in Le Monde itself featured a cartoon depicting a little wind-up Taliban doll, “Made in USA” emblazoned across its back, carrying red, white and blue explosives and circling back toward Uncle Sam. Notice the Similarities with That Other "Coup", the One That Overthrew Leftist Saint© and Martyr™ Salvador Allende? President Allende became a tyrant when he broke his solemn oath to respect the Constitution and the Chilean laws [and because] his government [had] fomented the creation of armed militias … the origin of the Pinochet government is that of any revolutionary one, in which only the use of force was left in order to remove a tyrant [and to] "put immediate end" to these constitutional violations . It must be agreed that this was, in fact, an unequivocal call to remove by force the President who had initiated the use of force with the purpose of imposing a communist dictatorship. we know another Allende-like experiment would only be a collossal failure.